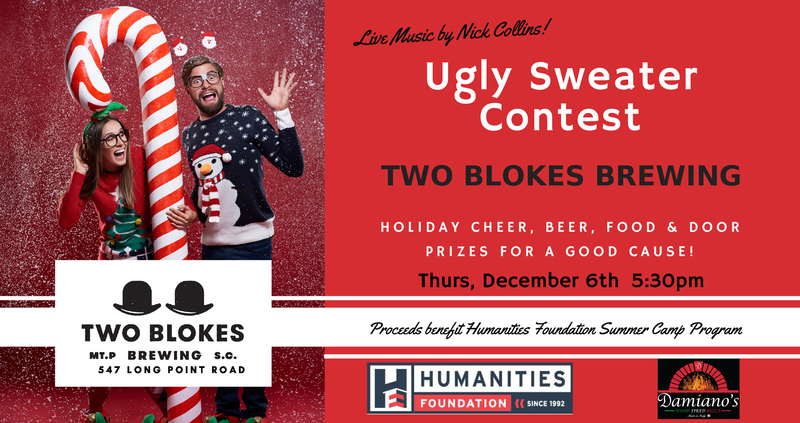 Join us at Two Blokes Brewing in Mount Pleasant on December 6! Feeling festive? Wear your best holiday flare and compete in our Ugly Sweater Contest to win a Yeti cooler cup! While you’re at it, grab a beer and enter our raffle contest to win awesome door prizes such as a getaway package to The Inn at Middleton Place, a drone, gift card to Germain Dermatology and much more! Raffle tickets can be purchased for $10 each. Damiano’s Wood Fired Pizza truck will be onsite to soothe your taste buds. Enjoy live music by Nick Collins. $1 of every pint of beer purchased and all proceeds from raffle tickets will go towards summer camp tuition for economically disadvantaged youth residing in our affordable housing communities. Humanities Foundation is a 501(c)3 non-profit organization and regional leader in the development of environmentally-friendly affordable and workforce housing. Enhancing the lives of our youth has become an important initiative. In providing the Humanities Foundation Summer Camp Program, space is created where children, many of whom might not be able to attend such a camp otherwise, can learn skills and receive the support that can help them grow into healthy successful adults. Happy Holidays! We hope to see you there.